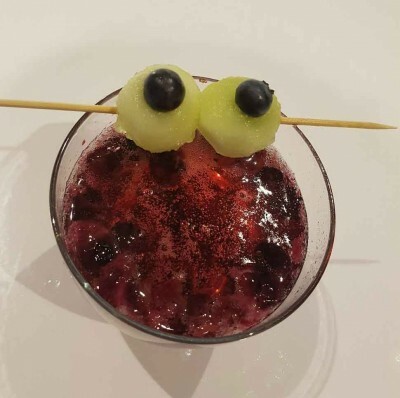 This was supposed to be a berry martini mocktail with a scary floating eyeball. Basically it’s a purple drink with eyeballs made out of honeydew melon and blueberries. You definitely need to make the eyeballs first, before making the drink. Some people have had problems with the eyeballs not floating, so I left mine on skewers. The next day I made a much simpler, colourful drink, using ribena and soda water. Much easier. And still great with the eyeballs.